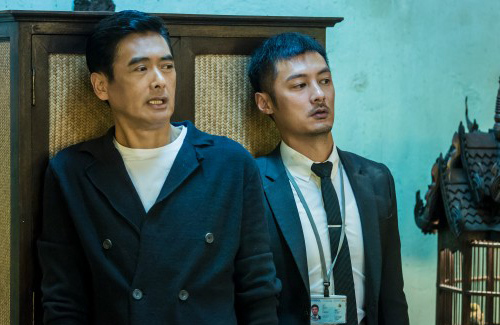 Shawn Yue (余文樂) is happy to be able to fight side-by-side with costar Chow Yun Fat (周潤發) in the upcoming Lunar New Year action film From Vegas to Macau 2 <賭城風雲II>, the sequel to Wong Jing’s (王晶) 2014 gambling action film. Shawn Yue portrays an Interpol officer who becomes the disciple of Chow Yun Fat. The new movie also introduces new cast members Nick Cheung (張家輝) and Carina Lau (劉嘉玲). While filming gunfire scenes side-by-side with Chow Yun Fat, Shawn said he felt as if he was filming the classic 1989 film The Killer <喋血雙雄>, which starred Chow Yun Fat. Shawn said Chow Yun Fat would use a mirror to watch the movements behind his back, and advise Shawn on the proper angles on how to hold his gun that is fit for the camera. I like Mr. Chow Yun Fat. He is a cool veteran and no nonsense person. But he had also proven to the Chinese community he is outspoken. Off the camera lights he talks to people with his good humor and being humble. I have always liked Chow Yun-Fat. Not only is he has good humor, he also helps and gives advices to young actors. No wonder 5 members of TVB Five Tigers all like him. I would prefer Chow Yun-fat over the communist Jackie Chan. Chow Un-fat > Jackie 100s+ times. I don’t think communism works well in practice so I’m not really for it politically but don’t talk about it as if it’s something horrible, it’s a complicated political movement that’s noble in nature but failed to deliver. As for Jackie Chan: he’s scum. Chow Yun Fat is my all time favourite actor.He is always nice and humble.He should be everyone perfect idol! i prefer to see chow yun fatt and chan yuk lin act together again or doing charity together as they get understanding to each other in their years. I would love to see him with Carol ‘DoDo’ Cheng more. I also like Idy Chan but still, it would be awkward if they will ever encounter each other. My god, he is so skinny. What happened to CYF? Older people who lose weight usually look really sick. Chow said he had to lose weight for this role. I prefer to see him a little meatier.